Now back from my lovely interlude with our new grandbaby and her parents in Toronto, I want to pick up my regular posting here, and particularly say a few more things about Scott Bader-Saye’s Following Jesus in a Culture of Fear by way of review. Following Jesus in a Culture of Fear offers a helpful variety of counsel on “putting fear in its place” and on developing courage, which the author defines as “the capacity to do what is right and good in the face of fear.” I mentioned in the previous post that he devotes, for example, a chapter each to the practices, or “risks” as he calls them, of hospitality, peacemaking, and generosity. In my opinion, he underemphasizes other disciplines such as prayer, worship, and gratitude (such as described in Philippians 4:6, mentioned in a comment to the previous post) as well as the truth of divine Presence in the midst of fear — that more direct experience of “Don’t be afraid” we hear in the biblical record. I appreciated, however, that Bader-Saye emphasizes the importance of community in courageous living. I don’t know if I’d made the connection in quite this way before. Fear can, of course, be communal, but often feels quite personal. If we are without community means we won’t have a place where we see what living well looks like, and we will also feel the scarcity of our own resources — the sense of, who can I count on? Courage, in fact, requires community, Bader-Saye insists — to learn it, to live it. Here we give voice to our fears, here share the risks and resources of living right in situations of fear, here bear the burdens of the more fearful among us. God is sovereign. Nothing happens that is outside his control or that he does not allow. I find when I talk this way, particularly in light of my son’s death, many people become uncomfortable. They quickly point out that God is not the author of illness, death, or bad things. I’m not arguing with their point, but you may be surprised to hear I don’t find comfort in the thought that God did not cause my son’s death. Don’t misunderstand. I’m not saying God caused Brad’s death, but I find it interesting how we rush to declare God does not cause evil, as if our faith is on the edge and in danger of slipping if we wonder about God’s role when bad things happen. I do find comfort in knowing that someone is in control, that life is not just a series of random events, some good, some bad. I find comfort in knowing that even though bad things happen, there is someone who has seen ahead everything that will happen and allows it. Brad’s death did not catch God by surprise, as it did us. God is in control. He could have arranged events in such a way that any number of people could have intervened to save my son’s life. But he didn’t. Well, I see I’ve come back to blogging after my interlude away with a vengeance, length-wise at least. Let me close by commending Bader-Saye’s book, and with the wish that all of us, whatever our circumstances, will experience the radiant “Do not fear” message of the Advent and Christmas season. 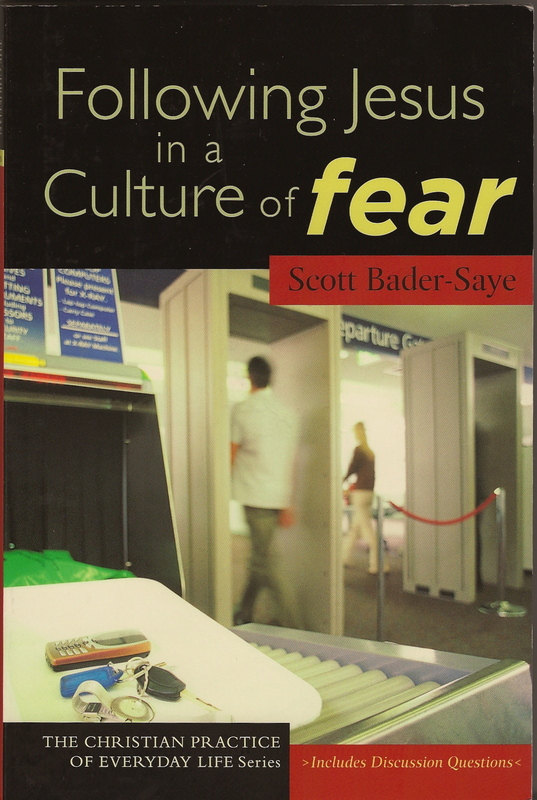 This entry was posted in Books, Contemporary life and tagged fear, Following Jesus in a Culture of Fear, God's sovereignty, Scott Bayer-Saye by doradueck. Bookmark the permalink. I’ve always loved the angels’ greeting, “Fear not!” This is an excellent theological treatise as well as a review, Dora. The depth of your reading and living shines through. Thank you! Are you aware of the new book on Anabaptist martyrs? Jeff Gundy posted to his FB wall this morning. Haven’t seen it yet. Community can support courage. It can also make courage to resist the community itself twice as hard. NPR’s This American Life features this week a series of stories called “Last Man Standing” about courage. Also, I appreciate the reminder to us US-based people to think about Canadian readers as we write. Many of us admire (and probably romanticize) Canadian culture, but that doesn’t mean we aren’t guilty of neglect when we generalize. I get the analogy to inclusive language! The example above–“American” and “Man” illustrates your point beautifully. Thanks Shirley! — I’ve been asked to review the martyrs book for Rhubarb, but haven’t seen a copy of it yet either. — You make an excellent point about community, that while it supports courage it can also make resisting within it that much harder. I think you’re absolutely right on the double-edginess of this. — Thanks for your sensitivity to my aside. One of the most shaping aspects of our national character certainly is the nearness of such a large and powerful neighbour, and not surprisingly the mouse is testier about the relationship than the elephant. But loving the non-bordered friendships of the blogosphere!